Charlie, not a natural hunter….. But, mostly, I have vague idea of where I’m going with a blog post and it sort of evolves around my mind as I type. I know, with my writing ambitions, more proof reading and re-writing is required, but the flavour of the blog is to just….. well, get it out there…..
I’ve had this idea of writing about anniversaries slopping around my head for a few days, but didn’t really know how to attach blogworthy significance. I know Facebook prompts me to remember the birth of my virtual friendships, reminds me of previous years frolics with pictures and posts and invites celebrations of fellow users’ birthdays, but some anniversaries need a more delicate touch…. Other anniversaries, like the day we lost loved ones, are less celebrated, but still marked, if only in our hearts. I like to remind myself of the good times shared, particularly with my dear departed sister, who I know would have loved to see me, finally, having the happiness which makes me treasure every moment. Enough of this, lets talk about running. I’m quite partial to donning the plimsolls and trotting along, as has been mentioned on this blog occasionally, and luckily for me, so is Nicky…. What a weekend of running we treated ourselves to. 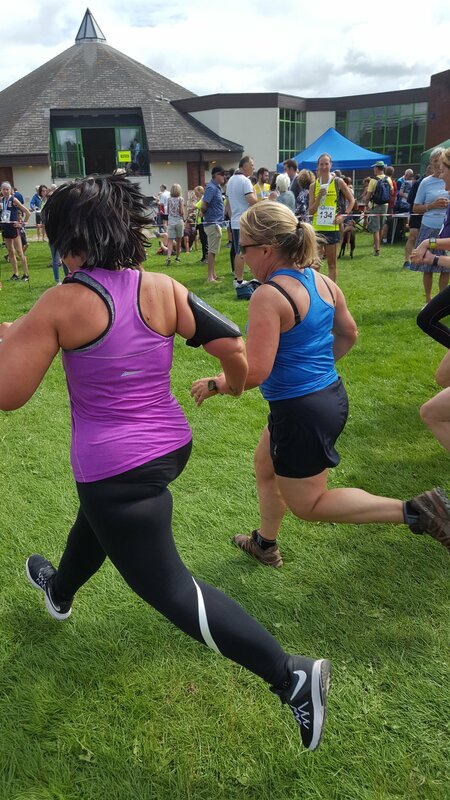 With Nicky fancying a change, we headed over to Parke (a national trust property in Bovey Tracey) for the fabulously named Parke Parkrun. Nicky drove the 16 miles, with Charlie and let him loose amongst the squirrels (he’s keen but far, far from being a hunter!). Me? I decided to run over……. Luckily I enjoy a bit of road running, not as much as the trails perhaps, but, sometimes, I like to run with a steady repetitive stride and zone out. Apart from the first 5 or so miles, this is a traffic free route, much of it on the Templer Way. 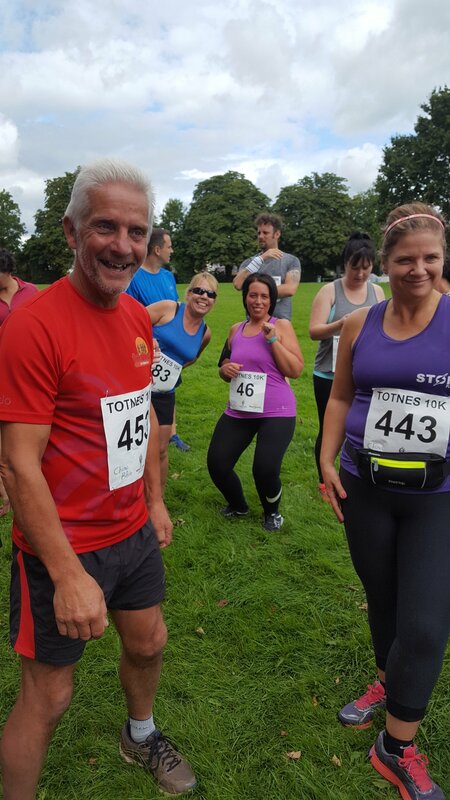 So those lovely slick bottomed road running shoes were brilliant alllllll the way to Parke……. Bacon bap and a coffee to follow, what’s not to like……. Nicky said this a few times on Sunday’s run. Our next marathon is coming, we’ll be running together, it’ll be on the road, and, it’ll be lovely and hot (so hot in fact, the start time is 5.30am to get some of it done before the sun comes up), we’re fortunate to be heading off for some winter sun and squeezing a marathon in whilst we’re there. Hence Nicky’s oft-repeated refrain during the lovely run. As ever, time is our enemy…….. please check out the other posts on this blog (there’s about 70 now!) and some of my other scribblings OVER HERE and keep in touch via FACEBOOK etc and look out for RUNDEEP MAGAZINE which features a column by yours truly. 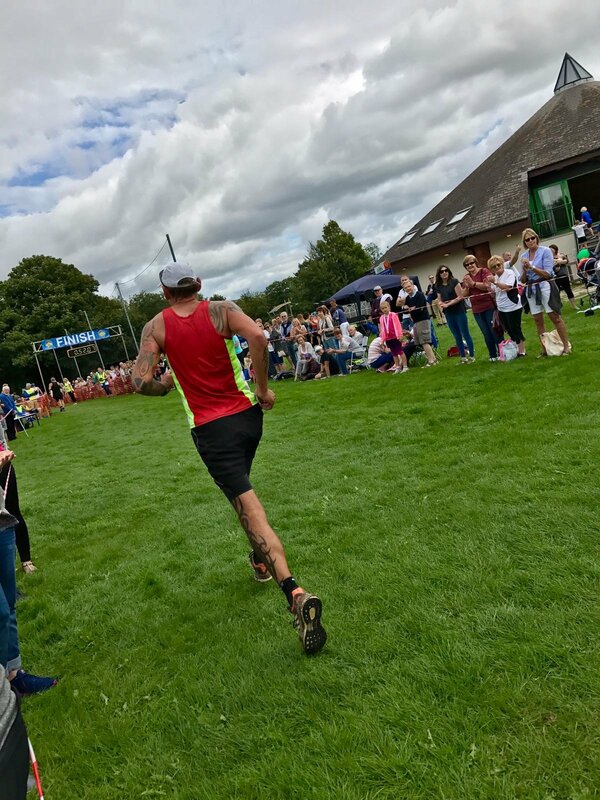 Tell you what, those mandatory kit lists for trail and ultra events….. have a listen to the interview with Adam Campbell on Talk Ultra….. I’ll be carrying the essential items EVERY time I go off the beaten track. Both interviews with Adam are on the podcast including the latest, after completing the Hardrock 100 . To the soundtrack of my own paddles breaking the smooth surface of the dark, becalmed water, I, almost blindly, forged into the darkness. That sensation when you’ve set a ridiculously early alarm. Suddenly sitting bolt upright “I’VE OVERSLEPT!!!! Oh no, it’s only 11.30…” Repeated at regular intervals until the alarm actually chimes at….. THREE THIRTY A.M.!!! Yup 3.30A.M. Hence the dark on the river. I know the river fairly well and the banks and massed trees loomed with sinister shadows to either side, even in the almost complete darkness. I stuck to the very middle and daylight gradually improved my navigation as I approached our rendezvous. Chilly? Looks it from the warmth of the kayak! Another weekend of adventure was well and truly under way…. I humbled am blessed to be sharing these precious weekends with my incredible, inspiring and, I don’t mind saying, HOT lady wife. Our friend in adventure, Martin, was driving himself and Nicky to Totnes. From there they would swim back to Stoke Gabriel from where I had just paddled (having left the car there). 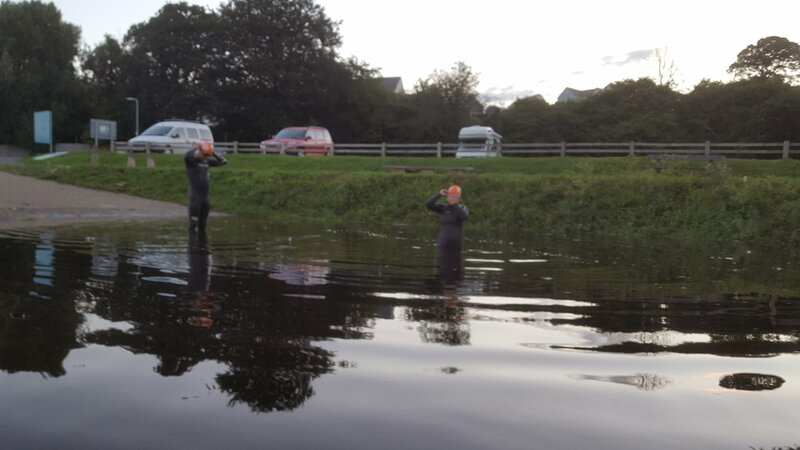 “I say old chap, the water really is rather nippy” (or words to that effect) Nicky exclaimed as they entered the river at 5.45AM. Martin concurred. Just a couple of false starts as they acclimatised then off. Approaching the first set of bends, the sun introduced itself through the trees. To describe the scene as idyllic would be under selling it rather. Over the next 2 hours we all agreed we had shared a magical and quite priveledged experience. 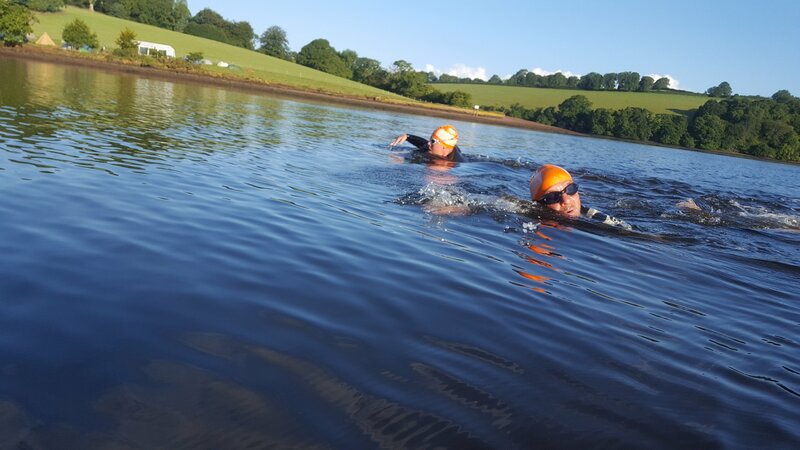 Being Martin’s first river swim this year, he wasn’t quite as confident as Nicky who was really powering on. At one point I had to signal her to slow down as I was uncomfortable with the gap between them. 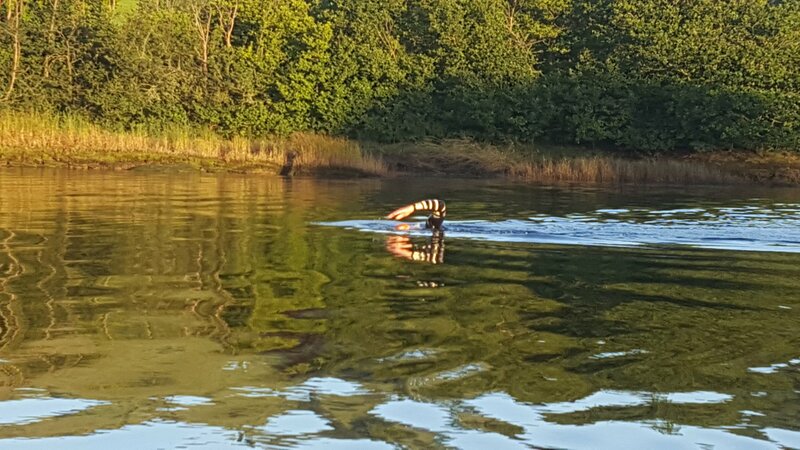 It might seem overly risk averse but, perhaps especially because of the early hour, any other river traffic we might be unlucky enough to encounter would be unlikely to be expecting to see two swimmers. Keeping both of them close to the kayak gives others more chance to spot us. As they climbed from the water, with most of the world yet to start their weekend, we were all smiles and back slaps. Leaving them to retrieve vehicles, I set out on the next instalment of the weekend. 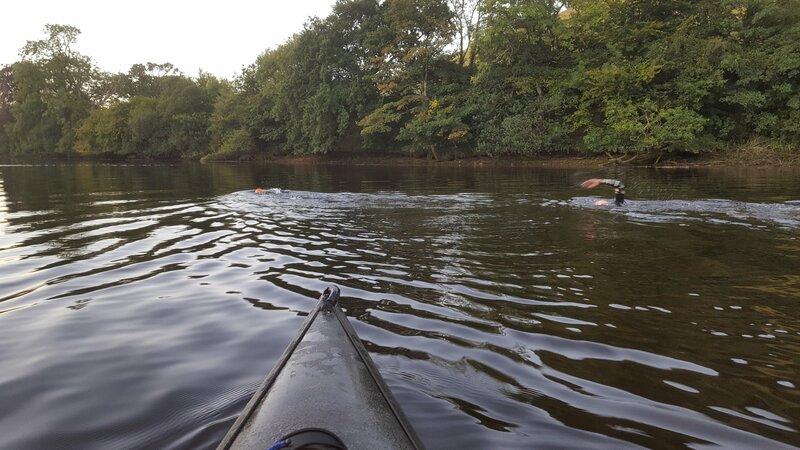 With The East Farm Frolic looming, I felt my fatigue from the weeks work and a rather short sleep, plus this morning’s hard kayak to Totnes would help me replicate running tired in the later stages of the 12 hour event. I was right. I felt very tired. Having waxed lyrical about last week’s long run, I won’t dribble on…..
Suffice to say I stuck mainly to trails, some of them completely new to me and managed a satisfactory 30 miles. Loads of great routes to check out here. I arrived back home, into the garden, to the wonderfully chaotic scene of grandchildren, step daughter, father-in-law and a refreshed and beautiful Nicky. All seem pleased to see me and enjoyed a “MAN DOWN!” moment as I slumped onto the garden bench! My recovery was accelerated by the invitation to join the imminent mob march to the beach for ice cream. Too tired to join our neighbours barbeque gathering, an early night beckoned. They are a musical crowd and it was quite mellow drifting off to the distant strum of a ukulele…….. I’m sure I dreamed of cleaning windows……..
Phew! So rest day Sunday…… naahhh….. The year Nicky and I got together, we were both at this event. We didn’t spot each other but less than a month later we were embarking in this incredible adventure that is our life together. So it’s always a special day. But this year topped them all. After 30 miles the previous day I was fairly confident I wouldn’t be troubling my PB list!! So, with my parents supporting, step daughter, Lou supporting too, it was a true family affair. “Go get ’em Mum” yelled my other step daughter, Alisa as the two of them tore across the field towards the finish line. 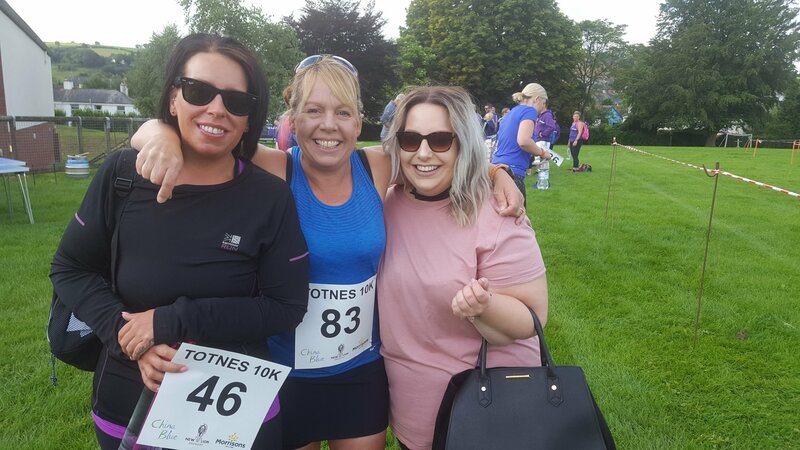 Three ladies from the incredible Plymouth based club, Storm, vied with them to cross the line first. 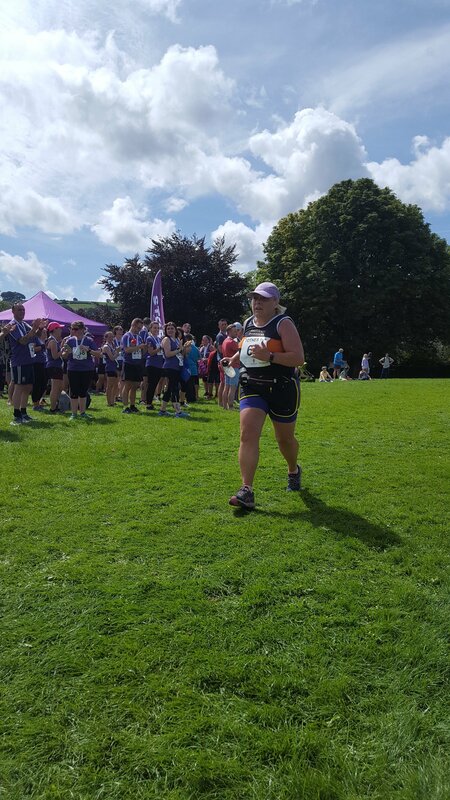 This was Alisa’s first ever race as she continues smashing down the barriers on her incredible journey of weight loss, healthy living and fitness drive. Lou and myself both seemed to have something in our eyes as Nicky and Alisa crosses the line. The boy is a STAR! 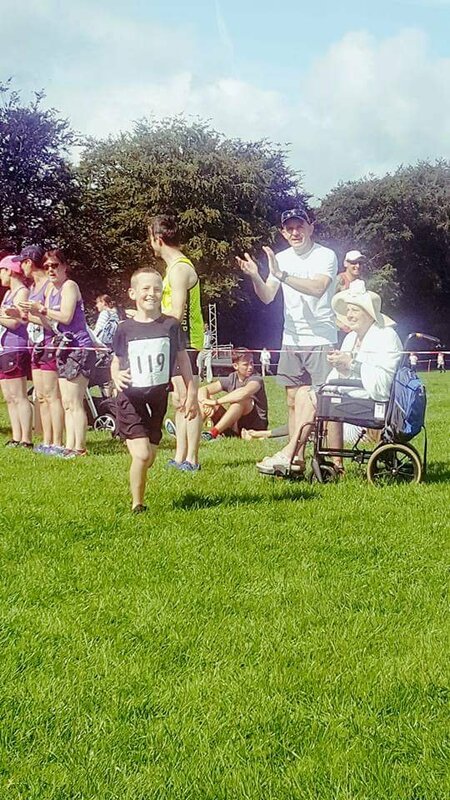 Proud too as I lined up with grandson, Callum for the fun run prior to the main race. 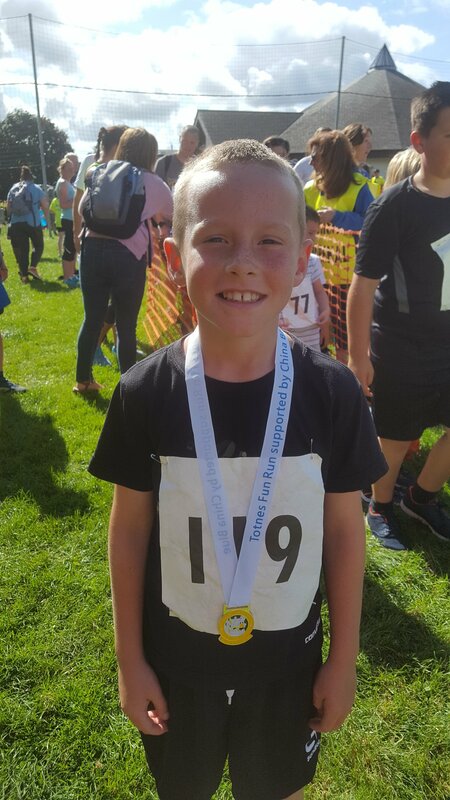 He blitzed around his mile in under 9 minutes and it definitely loosened my creaking legs! One of the best family says on the local race calender, the 10k itself winds it’s way to Dartington via the trails alongside the river. There’s a lumpy section with one proper climb about 2/3 of the way and the going is sapping, but after the Snowdonia Trail Marathon the other week, it’s pretty much flat! Setting off with the afore mentioned Martin, we ran toe to toe for about 4 miles until he goaded me in to running harder. 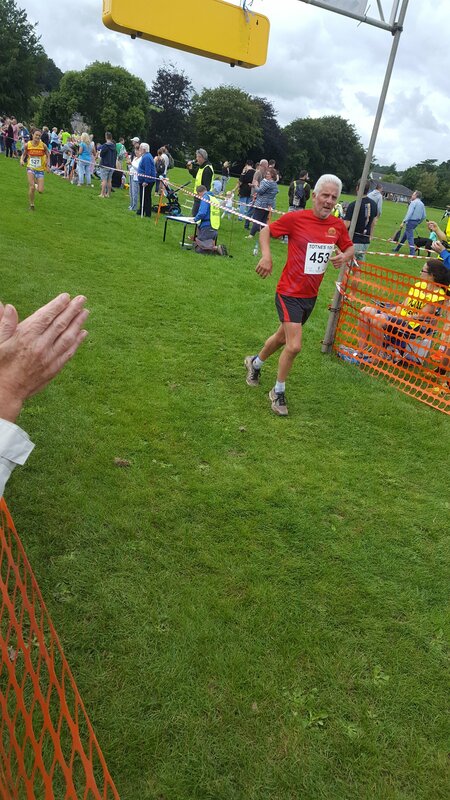 I was really pleased to clock a couple of swift miles towards the end and thoroughly enjoyed the whole experience. A fabulous event, thoroughly recommended, great to meet up with so many familiar faces from the running community. STORM – setting up camp at a race near you! Two clubs in attendance on mass were Teignbridge Trotters and the afore mentioned Storm. Storm are quite a success story, in only their second year and have well over 1000 members. 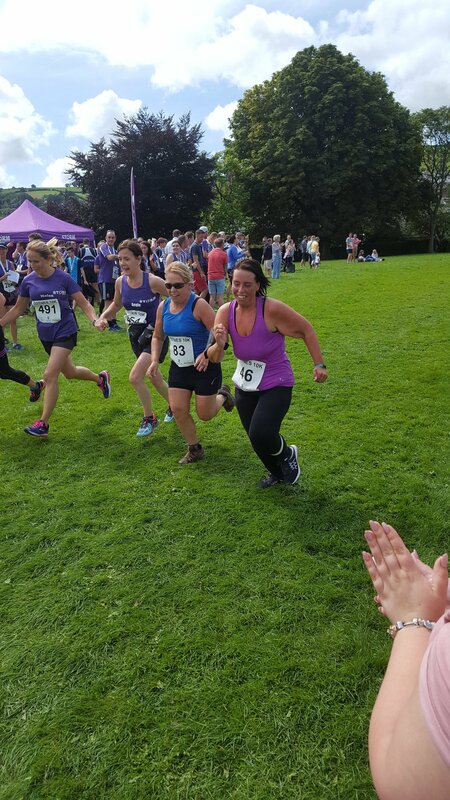 Over 100 of them toed the line in Totnes today, a fine blaze of purple. 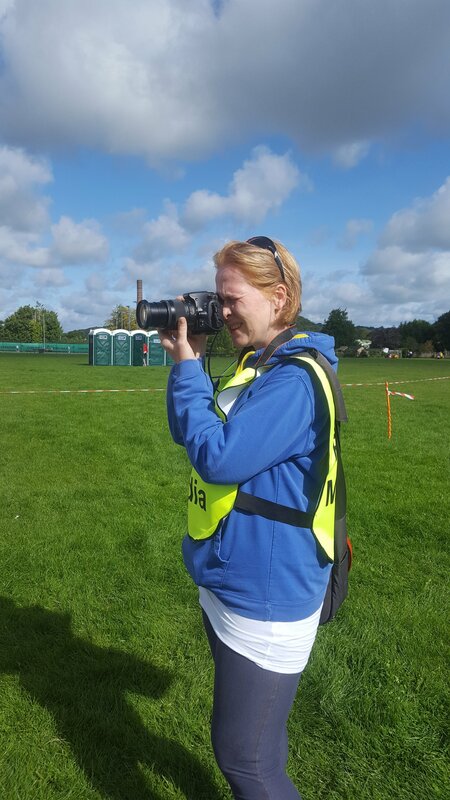 The Teignbridge Trotters, meanwhile, our hosts for the day, provide (as with all of their events) a fabulous atmosphere, family friendly environment and set up barbeques, hot drinks, a bar, a constant running commentary which is quite legendary, photographers (piccies are free!) 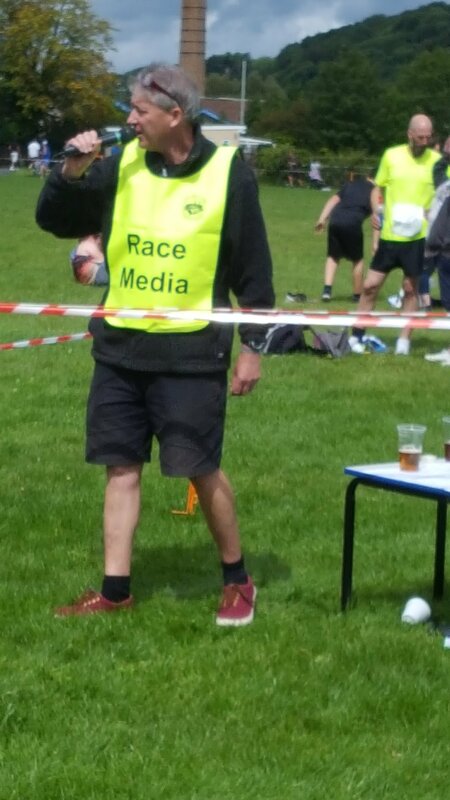 and a fantastic, well marked, brilliantly marshalled course. Sign up early next year, it was massively over subscribed this year. 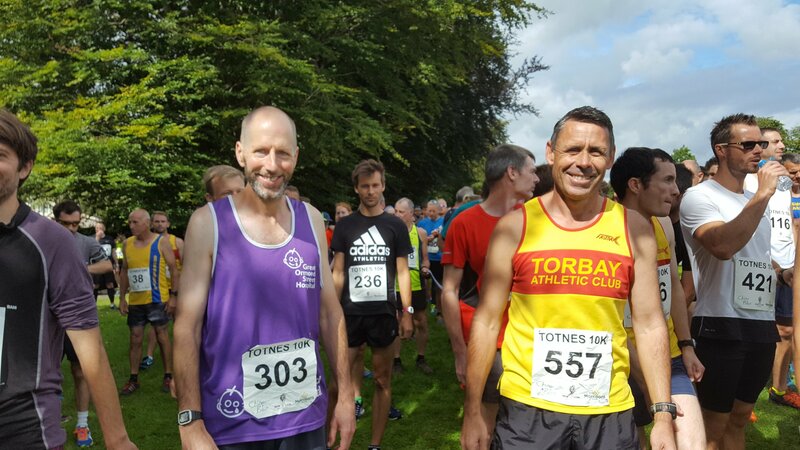 Next up for us….. the RAT 32, miles on the Cornish coast……. Meanwhile some more piccies from the weekend…. I was a publican back in the day. I couldn’t do that now. I’m tucked up in bed hours before pubs close! Anyway, a member of staff systematically stole off me for a while back then. I won’t bore you with the details, but it was quite clever what he did and it took me a while and a couple of observant and loyal customers to catch him. Obviously, his welcome in the pub ended at that moment. It was quite a surprise when, a few months later, I had a telephone call from a pub chain in London asking me to provide a reference for this chap. Apparently it was for a key holder position. After holding back a whole Ramsey of expletives, I apologised and said that I was unable to provide a reference. Rather than wade into the reasons why, I decided to simply confirm his employment dates and then say nothing more. I try to focus on the positives in this blog, it is only my thoughts and my opinions, yet I tend to avoid long descriptions of things which I don’t particularly recommend. So, a review you say?? Of this event you say?? I’d rather tell you about the latest book I’ve read…………. Extremely Loud & Incredibly Close by Jonathon Safran Foer, a quite sparkling read. Tackling one of modern history’s most tragic and startling episodes, the story is told to the backdrop of the terrorists attacks on The World Trade Centre’s twin towers, 9/11. Whilst a work of fiction, amongst the, quite literally, thousands of tragic tales resulting from the attacks. It is a tale of loss, of identity and of searching told through the eyes and mind of a 9 year old boy. Oskar, the 9 year old, lost his father to the attacks. In searching for reasons and understanding, Oskar comes across a key. He believes this key will open something, a door, a box, a security lock and the story is his trail through New York attempting to piece together a mystery, to find a connection to his father again. Voices from family members past are used to link the characters and bonds of love, friendship and kinship are quite beautifully knitted together. The fact that this process is narrated by a (admittedly unique and advanced) 9 year old, makes the story even more beautiful. If you don’t shed tears, chuckle, and need a hug or two from reading this book I’d be most surprised. It takes some ‘reading into’ to get the feel of the prose and time structure, but once you’re in it, you’re staying! I won’t give too much away, as the journey with the key, the history as told by his grandmother and the snippets of clues as to what ACTUALLY happened to his father are mesmerising. Certainly one of my favourite reads of the year so far. Nicky and are both avid readers and, whilst we have our favourite styles and authors, nothing is off limits for having a read. We’ve agreed, too, that it’s ok to give in and put a book down half read if we’re really not engrossed by it. Nicky is certainly more prolific than I, perhaps because she doesn’t rattle away on the keyboard like this, instead happily snuggled up with Charlie and I on the little sofa, ploughing through the chapters whilst I click-clack away. In fact, only this evening, she proclaimed “I still haven’t found her head!” whilst buzzing with the intrigue and page turning suspense of another Peter James novel…. VERY peaceful after they’d left!